Value must be recognised by the customer - use his rules. Services are invisible, intangible so how best to sell them? By describing clearly the value that they can bring to the customer. This is done by estimating the value to the customer, the investment required and describing how a customer reference has received similar value . The delivery vehicle for communicating value is known as a value proposition and can be used for all kinds of sale but is particularly useful for complex services sales. It is normally used initially in prospecting to get the attention of an executive and to get agreement from him to assign resources to work together on an evaluation plan. This will include the creation of a detailed business plan to ensure that it is the right decision for the company. A very simple value proposition example using the services offered by O’Brien Business Solutions is shown below. a Business Solution designed and implemented to deliver delivering Sales and Marketing programmes. an 1 year contract and a start within 2 weeks. a similar Business Solution to Customer Reference A where a Business Growth of 20% was achieved in the same timeframe. Increase efficiency by 10% resulting in a 5% increase in profits per annum. Relevant staff transferred according to TUPE. Benefits realized in years 2-5. Value is referenced throughout the sale. It may well start with a straw-man, built using data from a previously successful customer or reference and extrapolated to address this particular customer. It will be developed as the sale proceeds as more detail on the solution is developed and information on the assumptions is discovered. In some cases, some pilots may need to be implemented to test some key assumptions in the value equation. The best relationships in business have the delivery of value as their foundation. A sales person that is perceived to consistently deliver value (advice, information, solutions) will be better placed to form better relationships. A Goal/Objective for the CEO flows down to the CMO and down to the marketing department. For instance the CEO may have an objective of increasing the average revenue per user. This will be come a lead generation objective by the marketing department and an opportunity conversion objective by sales. A Value chain may be created to move from clearly known objectives at the top of the organisation to create new ones lower down the organisation. Selling into the Early Market is characterised by no or very limited customer references that will underpin the value proposition. Whilst the Early Market is also characterised by buyers that are more innovative and as such prepared to take a risk, they do need some rationale for taking a decision to proceed. Services do have more difficulties here than say selling a product like a piece of equipment in that a piece of equipment can be tested by a third party and the benefits verified. Complex services such as BPO require at least one customer reference before the value proposition mat be truly verified. And as such it underlines how important the customer references are and therefore it is worth the company putting a lot of resources into obtaining the first contract an delivering it. It is worth noting also that it will take time before the benefits can be calculated and therefore will take time before the contract can become a true customer reference. Start with a good relationship and trust as a foundation? Can you use process that is being done inside (selling) company’s own organisation? Does the new process utilize a core competence of the (selling) company? For instance a new technology that will improve the process. Examine its use in customer processes and obtain results. Utilize Market research to verify the value proposition. Find market research by a respected third party that will verify the claims made in the value proposition. If adequate market research is not available then conduct bespoke market research that will verify the claims made in the value proposition. Using the information and the market research to build a model with clear assumptions, a value proposition straw-man may then be created. For an innovative customer, or one that has a pressing issue that requires resolution this will be sufficient to proceed. Normally they will require the assurance that sufficient support will be provided to address any unforeseen problems efficiently. Value = Total Benefits-Total Investment. The description of Value delivered by the marketing department will be much more powerful if linked to Value delivered to CEO and company objectives. So a Value chain may be created that shows the Value that each department adds to the creation of this overall Value. 2. The Sales Department must generate a specific number of new sales by converting a certain percentage of qualified leads. 3. The Marketing Department must generate a specific number of qualified leads. If you are selling equipment for a data product or a means of generating qualified leads then a conversation with the CEO based on the Value delivered in achieving his objectives will be better received and understood. Equally, the marketing department will secure its budget easier if qualified in terms of delivering Value towards the company objectives. Best practice dictates the sale is opened, driven and closed with Value. 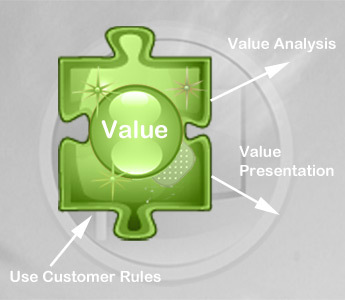 Value must be described in terms that are relevant to the customer. The Value proposition normally includes (i) the delivery of a tangible customer goal, or the resolution of a customer issue or pain in clear quantifiable terms (ii) for an acceptable investment. Or in other words: Value = Total Benefits – Total Investment. Increase Average Revenue Per User from £22 per month to £26 per month resulting in an increase in profits of £5M per annum within the first year. 3 new Network Nodes costing £2M. Value flows throughout the organisation.